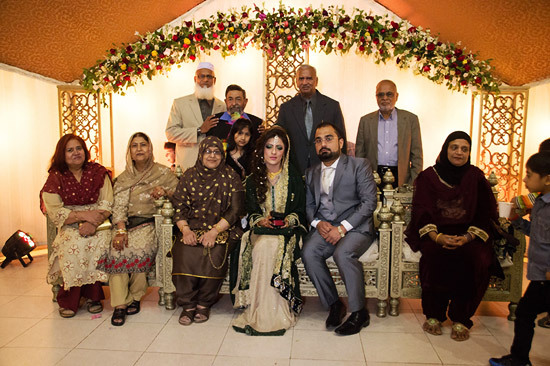 Farhan Hussain Siraj, son of Mohammad Siraj Uddin, married Shumaila Mustafa, daughter of Ghulam Mustafa in Karachi, Pakistan. Farhan is the son of Mohammad Sirajuddin, Ex-Aramco Employee Badge No-73029 who worked in Dhahran from 1975 thru 1992 in the Contracting Department. Farhan got his early education from Saudi Arabia, followed by Higher Education Masters in Business Administration (MBA). Worked for RIA Financial Services, as a Business Development Manager in United Kingdom, currently working as an Account Manager for the Multi-National Company based in Pakistan. Shumaila Farhan, completed her studies in Pakistan and got a degree in Dental Surgery (B.D.S.). In Canada she acquired further education in Dental Hygiene (Diploma in Dental Hygiene). She worked in Canada as a Dental Hygienist, now working as an Associate Dentist at a private Dental Specialist Clinic in Karachi, Pakistan. The Valima Reception was held at Faysal Point Lawn in Karachi, Pakistan on December 30, 2014 and was attended by ex-Aramco employees Mr. Mohammad Abdul Mateen, Mr. Ghulam Qutubuddin Khan, Mr. Mahmood Hussain and Mr. Nisar Ahmed with their families. 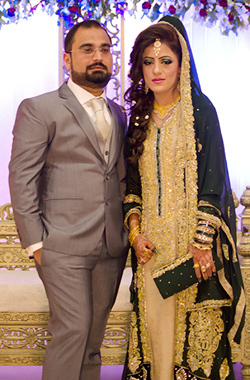 SAEEA wishes Farhan and Shumaila a very happy married life and a very bright future.